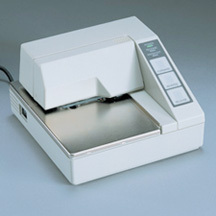 The Weigh-Tronix TM-295 ticket printer is a terminal device with the speed and versatility to make it an economical choice for industrial scale applications. Its versatility is demonstrated by its list of functions. It prints multiple character sizes, has forward and backward paper feed. You can program page length for page sizes from 3.5″ square to 7 by 10″. The TM-295 ticket printer even has a cash drawer kickout function. It uses standard RS-232 interface, making it an easy peripheral to apply to data gathering equipment. Its 512-byte memory buffer allows data reception during printing, improving throughput by cutting waiting time from the host device.